The Our Worlds At War cover Jae did for Wonder Woman, is one of the all time best images of the character. Here, taken from the new Superman/Batman title, I dig the way Lee at his minimalist best shows Diana strong and forceful, while still a woman in pose. Sure she's picking a fight with a God, but the angles in her costume, chestplate, belt and dress, all lead down to her 'victim', making for one hellraising piece - literally! I love the way her skirt looks like it's about to skewer her target as well, while she seems relatively unconcerned about anything. Jae Lee's art is always so moody and almost scary in its design - I would dearly love it if he were to draw our lovely Diana in her own book for real. Sweet pose, and you can never go wrong with Jae Lee art. Just look at how far he's come since his early years on Spider-Man and Namor. Wow! Thanks folks! Happy holidays to you all! Dale, he sure has, Stephen King's The Dark Tower really has brought him into a whole other level. He was unique before, now he's an icon. 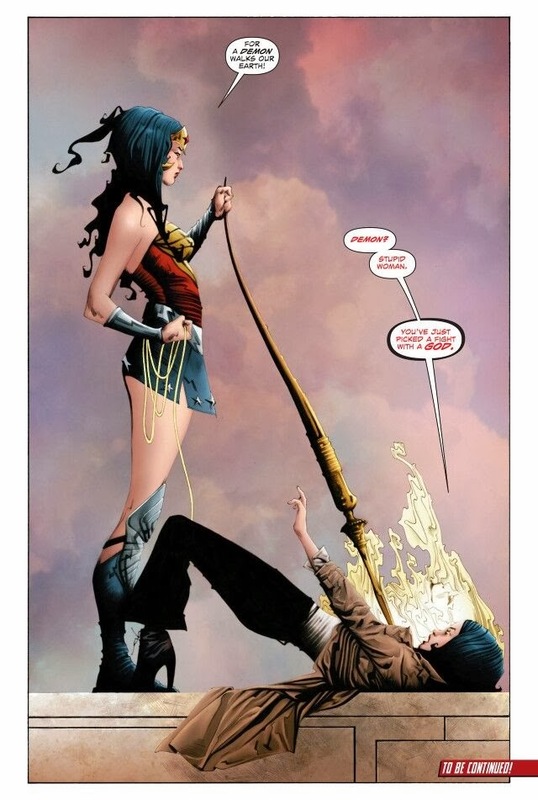 Karl, Lee's Our Worlds At War cover of Wonder Woman is one of my favourite images of the character ever. If perfectly captures her fighting savvy yet hope for piece at the same time. In Superman/Batman he's taken that one further and put her strength in and had her ride a pegasus. I tell ya, it's gold in print. I love that aspect too Random. I think that's the key to Wonder Woman in a way. She's not smug but she's always confident and quietly competitive she can take you. She doesn't have to be moving for there to be all kinds of action in this scene. Lee is great at that. Nice to see his technique hasn't deteriorated since I last saw his work. That's it exactly Kal, you reminded me of that classic shot of Mr Freeze about to icepick the back of a frozen Batman's head. Lee draws it in such a way you know the moment is frozen in time, but you still can feel and fear it's eventual impact. Thanks for the comments!